The terrible truth of high school football is that only one team gets to win the very last game. After a long, hopeful season, Helix Charter High School has finally joined the throngs of teams to hang up their jerseys for the year, just shy of glory. Runner up for the CIF San Diego Section Open Division Championship, second seeded Helix (10-3) lost their title match against first seed Cathedral Catholic High School (13-0) on Dec. 3. The Highlanders, 2015 defending champions, did have a great start, up 14 before the end of the first quarter, but as soon as the Dons found their footing in the gravely turf of Southwestern College’s DeVore Stadium, they came back with oomph. In front of nearly 8,000 fans that packed out the venue, Cathedral’s offense pushed through to even the score at halftime and then take a commanding lead, 35-14, in the third quarter. The Don’s offensive approach was a simple one, but Helix was missing a key component of their normally stellar defense: senior middle linebacker Ezekiel Noa. Noa, one of the team’s best talents, sustained a knee injury during the semifinal win over Rancho Bernardo. Although he attended the game to support his teammates, he never left the sidelines. Without Noa, the 2015 San Diego Section Defensive Player of the Season who is up for the award again this year, Cathedral rushed 427 yards against Helix. Noa’s younger brother freshman Elelyon Noa took his place as starting linebacker, rushing 16 times for 71 yards. The younger Noa said he missed his brother on the field. But a player like “Zeke” Noa is irreplaceable, said Owens, attributing much of Cathedral’s advances to the hole he left in the lineup. With half a quarter remaining, wide receivers Scott Young and Rashad Scott and quarterback Carson Baker rallied for 13 more points before the Dons let the clock run down on the last three minutes. Scott said, although the loss is disappointing, he is grateful to have been able to play at this stadium again. It was a challenging season for the Highlanders, said Scott, but at the heart of all things they remain grateful. “We had coaching changes, we had a young team, but we made it here and that’s all that matters,” he said. 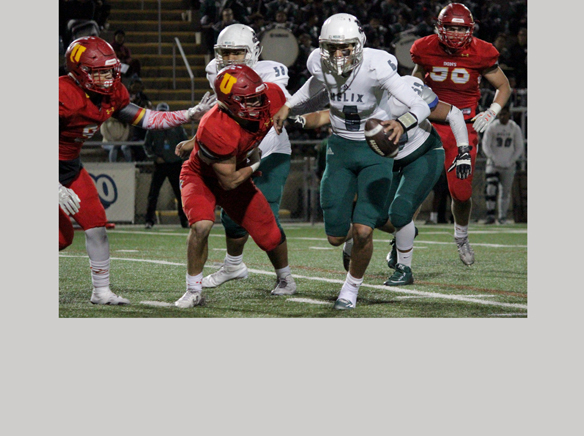 Dry eyes were hard to find as the clock ran down on the last game of Helix’s season. Owens, who has now completed his first season with the team, said the end of high school football every year is especially bittersweet. Owens said he does not expect Helix to be down for long. San Diego Gulls: did you know?